Summer is here and that means spending warm nights outside on the patio or in the garden, enjoying the sunny weather and the company of friends and family. A time to sit back and relax… only possible when you’ve chosen the right outdoor furniture! With outdoor furniture comfort is essential. 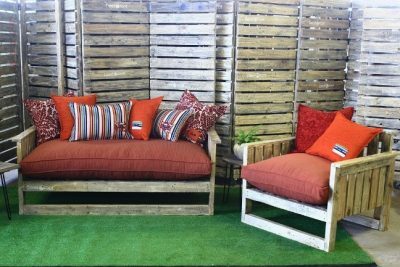 The Beetroot Inc. Sarah Barber range is perfect for the patio – 1.6-meter couch made from reclaimed wood with a stuffed cushion seat and numerous scatter cushions to complete the offering. Choose from different colours and designs to decorate according to your own personal style. When eating al fresco a patio table set is a great choice, or if you’re thinking about entertaining maybe a few patio benches is the better option. Serving drinks or entertaining around a braai? The perfect piece of furniture for this is the functional utility trolley – any size, open or flat top – and when you’re done you can wheel is back inside to use elsewhere. Make sure that you stay on trend by choosing the right designs and colours but go for practicality at the same time, for example multipurpose furniture choices and zip-off cushion covers. Visit your closest Beetroot Inc. store in Gauteng, KwaZulu-Natal and the Western Cape to see what’s on offer or visit www.beetrootinc.co.za. Previous: Join the Joyride with Cadbury for a chance to win a CUSTOMISED Jeep Wrangler! With the hard-hitting winter weather and fires in the Western Cape, and cold temperatures creeping in around the country as winter fully sets in, having adequate insurance cover is essential. Insuring your assets such as your car and property via an insurance adviser can really go a long way in helping you get the right cover for your specific needs. An adviser also helps you to reduce your time and admin, should you need to claim or make any cover adjustments. But how do you go about choosing the right one? Below are some guidelines to follow. Once you have found a few options of firms to consider, look at their various websites for a full view of the offering available. Investigate further by viewing their social media feeds and searching for them online – determining if there are any public complaints posted about them, or any FAIS Ombudsman issues hanging in the balance. “You really need to get a sense of who they are, how they are perceived and how they operate,” Visser says. Once you have narrowed this down further, you can look at the various advisers who work at your preferred advisory firm. Considerations that might help you choose would be looking at their track records and qualifications. “If you are not just looking to insure your personal property – perhaps you are also a business owner – you will have more specialised insurance requirements, and you will need an adviser who is equipped and experienced to assist,” he adds. Ideally, your adviser will be supported by administrative staff and other advisers. This gives you peace of mind should he or she be unable to assist you for whatever reason. A well-run office ensures your claims will be dealt with efficiently. “You are fully within your rights to ask an adviser about his or her office setup and even request to meet other key members of the firm. You can even ask for referrals given by other clients. Think of it as a job interview – you are employing an adviser who needs to be the right fit,” Visser says. It is very important that you feel comfortable with your choice. You are looking for a positive, productive, long-term working relationship, and should expect your adviser to be honest and straight-forward, fully disclosing all details about any insurance products or processes to you. Your adviser should be accessible to you and always look out for your best interests. He or she will be able to help you ascertain adequate contents cover, for example, or advise you on what maintenance is needed at home or your office to comply with your insurance cover. With enough groundwork, finding the right insurance adviser is a worthwhile process to keep you covered,” Visser concludes.